Join Roland Neave, owner of Wells Gray Tours, on one of our two tours to Wells Gray Park in 2014.Roland’s first hike in the park at age 14 ignited a passion for the park that still burns bright today. Roland was so captivated with the majestic waterfalls, breathtaking landscapes and history of the park that not only is he a frequent hiker in the park but is also the author of the book, Exploring Wells Gray Park. Roland’s love and knowledge for Wells Gray Park made it a perfect fit for him to volunteer through the summer of 1972 as a guide at a time when the park’s very existence was threatened by the building of dams on the Clearwater River.The following year, needing a summer job during university, Roland decided to create day trips into the park.After graduation, he began to expand his tour destinations, and from these humble beginnings grew Wells Gray Tours. Every year, Roland guides our tours that travel to Wells Gray Park and shares his knowledge, the history and stories of the area.We plan our tours to the park for late May or early June to capture the waterfalls, 39 in total, when they are the most spectacular with spring runoff. My first trip to Wells Gray Park was in June 2009 and, while I had lived in BC for over 30 years and heard lots about the magnificent falls in the park, I had never taken the time to visit. It is not uncommon to miss out on what is in your own back yard, so when the opportunity to spend a day in the park with Roland presented itself I did not hesitate and neither should you. It is a rare and unique opportunity to visit such a beautiful and majestic park with someone who has such an intimate knowledge of the area. 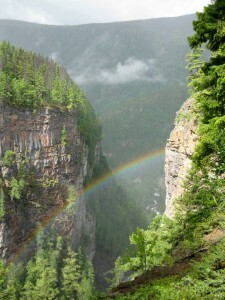 Even if you have been through Wells Gray Park, this is a tour that you should definitely not miss. Next departure is May 31 for 3 days.